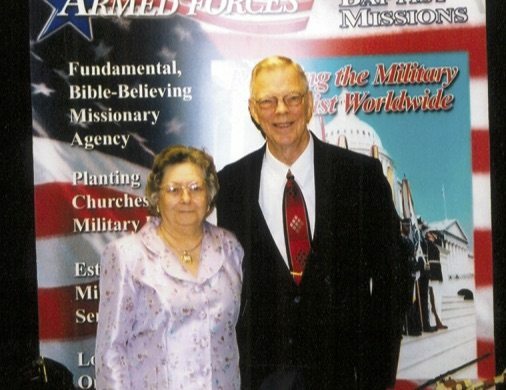 Martha and John are excited about their decades of service with Armed Forces Baptist Missions. Their life’s passion is missionary service reaching our lost military heroes and their families. As a WWII Veteran, our former Deputation Director, and representatives they understand first-hand the challenges of our military families and the struggles they face. They are currently serving in Raleigh, NC as Veteran’s homes’ missionaries with an effective ministry to our elderly veterans and families. Their ministry is a fruitful picture of our Lord’s grace seeing people regularly saved in their eighties and beyond. John was saved as a young man and surrendered his life to Christ on the battlefields in Europe. His promise to the Lord-“If you get me through this, I will serve every day of my life”-has never been broken. John has been more than six decades in the ministry. Martha was saved at a young age and upon graduating from college served as a missionary to the nation of Japan. She and John met in 1962 and were married the following year. Martha is the consummate help-meet and a friend to everyone she has ever met. God calls AFBM missionaries to serve in unique ways around the globe. Maybe He is calling you to have a special role in John and Martha’s ministry to Veterans. Please pray about partnering with them through prayer and/or financial support. Contact the Littles to learn more about their ministry.